There is disparity in the nursing work-force of minority leaders. The aim of this article is to describe and evaluate an innovative program designed to provide mentorship and increase leadership skills of minority nursing students. An innovative mentorship program was developed including coordination of financial aid meetings, incorporating technology, enacting an online preimmersion course, choosing and training mentors, hosting a lunch-and-lead leadership series, and using intensive review sessions and tutoring. Program evaluation data were analyzed using mixed methods. All 40 participants passed the NCLEX-RN and had obtained employment after the program. Of the 20 respondents, 25% already had obtained a leadership role in nursing. Qualitative data about the program revealed categories of leadership, networking, mentorship, more time, and gratitude. Currently, there is a need for highly qualified nurses and nurse leaders from diverse, underrepresented backgrounds (Institute of Medicine, 2010; National League for Nursing [NLN], 2017). This shortage likely results from a pipeline of barriers. Barriers may be familial, socioeconomic, and/or geographical in nature (Metcalfe & Neubrander, 2016). Many students of minority backgrounds have received their education in public schools, as opposed to private schools with ample funding, placing them at a disadvantage when compared with their counterparts (Metcalfe & Neubrander, 2016). Additional barriers include lack of finances, limited proficiency in the English language, the pressure to support the family by working (Haynes, Jacobson, & Wald, 2015), and lack of role models in the profession. In addition to these barriers, the NLN (2016) reports that the current lack of inclusivity in nursing education poses challenges for minority students to complete their studies successfully. Leading professional organizations in nursing to suggest improved recruitment and retention efforts geared toward underrepresented nursing students to narrow the gap in the nursing workforce; ultimately, enabling better care for diverse populations (Lim, Brown, & Justin Kim, 2014; NLN, 2017). As minority enrollment and student retention is a prominent issue, programs designed to foster minority nurse leaders are scarce but warranted. The Future of Nursing: Leading Change, Advancing Health report by the Institute of Medicine (2010) called for an increase in the educational preparation of the future nursing workforce. Within that directive was an initiative to increase the recruitment and retention of nursing students from underrepresented backgrounds to better address the needs of the diverse patient population. In the United States, the nursing workforce is made up of mainly White/Caucasian nurses (83%), with the remaining being Black (6%), Asian (6%), Hispanic (3%), and Hawaiian/Pacific Islander and/or individuals identifying as other (2%) (Budden, Zhong, Moulton, & Cimiotti, 2013). These percentages fall short of mirroring the diverse demographics of the patient population in the United States. According to the 2015 U.S. Census Bureau data, most of the population identifies as White/Caucasian (77.1%), with the remaining individuals identifying as Black (13.3%), Asian (5.6%), Hispanic (17.6%), and Hawaiian/Pacific Islander (0.2%) (U.S. Census Bureau, 2016). When comparing these data, there is a disparate representation of Black and Hispanic nurses in the United States. A way to increase the likelihood of success for nursing students from diverse backgrounds is through the creation of mentorship programs. Mentorship programs assist students to receive the necessary tools to succeed and receive remediation early if needed (Metcalfe & Neubrander, 2016). As many schools document high attrition rates in nursing, retention strategies including mentorship are common. However, few programs in nursing have created and evaluated the impact of mentorship specifically tailored for minority students in nursing. In a systematic review conducted by Jokelainen, Turunen, Tossavainen, Jamookeeah, and Coco (2011), more than 23 nursing research articles addressing student mentoring from the perspective of mentors, leaders, students, and educators were evaluated. The publications focused on nursing mentorship and clinical placement of nursing students. The researchers concluded that the mentoring of nursing students in their clinical practicum was presented in two themes. The first theme was Facilitating Students, and the second was Strengthening Students. The first theme discussed the need to foster a clinical environment where the students will be prepared with mentorship for clinical practice. The second theme encompassed empowering students to develop a professional identity and enhance their professional competence. Although this systematic review provides some insight to mentoring programs, it does not provide a precise description of the mentoring programs and the true impact of these mentoring programs with underrepresented nursing students. The aim of this article is to describe and evaluate an innovative program designed to provide mentorship and increase leadership skills of minority nursing students. Research regarding minority retention programs in nursing is scant. One retention program designed to help minority student nurse retention was called the Nursing Network and Careers and Technology (NN-CAT). This program provided intensive mentoring, resources, and social events to increase the success of Appalachian nursing students (Metcalfe & Neubrander, 2016). Participants in the NN-CAT program were required to be U.S. citizens, have a minimum grade point average of 2.8, be nominated by a faculty member, belong to an ethnically underrepresented group, and be enrolled in the prenursing program. As a part of this program, participants received support with studying, test-taking skill development, and funding to help with daily expenses. Monthly stipends and extensive tutoring were offered; however, the researchers identified social determinants that prevented students from being successful in the program, including financial barriers, English proficiency, and cultural differences. Of the 22 students in the program, nine students were successfully admitted to a Bachelor of Science in Nursing (BSN) program or a two-plus-two program. The researchers noted this was an improvement from previous retention rates (Metcalfe & Neubrander, 2016). In 2012, the University of Miami was selected as a site to participate in the 1-year “New Careers in Nursing” (NCIN) Program of the Robert Wood Johnson Foundation (RWJF) and American Association of Colleges of Nursing (AACN). The NCIN Program included a grant and mentorship program for students who were admitted to the accelerated BSN program. The accelerated BSN program is a 1-year (three consecutive semesters) program designed for second-career students. Therefore, all students in the accelerated program had previously received baccalaureate degrees in other majors and had already completed the required prerequisite general and science courses. The NCIN Program provided a one-time, $10,000 nontuition restricted scholarship for each student to assist with financial support while completing the accelerated BSN degree. The purpose of this program was to help alleviate the shortage of diverse nurses in health care and was geared specifically toward underrepresented populations in nursing, defined by RWJF/AACN as African Americans, Hispanics, Native Americans, Asians, and those of male gender. Additionally, the funding agreement required the School to offer mentorship and leadership development activities for their scholars. At the University of Miami School of Nursing and Health Studies, this program was administered from 2012 to 2015, with a total of five cohorts. The 1-year mentorship–leadership training program was designed to support minority nursing students during their studies. Methods included a multifaceted approach involving financial aid, incorporating technology, enacting an online preimmersion course, choosing and training the faculty mentors, hosting a lunch-and-lead leadership series, and using intensive review sessions and tutoring. Mentors were required to meet for 30 minutes at least biweekly with their assigned mentee during their first semester and then monthly for the remaining two semesters of their accelerated nursing program. A program director (K.S.) was chosen by the dean to develop and oversee the RWJF Scholars Program at the University of Miami School of Nursing and Health Studies, as well as to monitor and work with mentors and leaders in the community. The program director was from an underrepresented racial group and was personally committed to the role and responsibilities. The program director was an assistant professor on a clinical track (nontenure line) and had 4 years of experience as a leader in nursing management. She had completed a 3-month leadership and mentorship training workshop for this role and followed the RWJF/AACN Mentoring Toolkit and Handbook (RWJF, 2016b). The program director conducted the faculty mentor training, scholar orientation, coordinated the leadership sessions, and tracked student progress on a monthly basis. The program participants were selected through a competitive process from the pool of students already accepted into the accelerated BSN program. Participants completed an additional application specific to the RWJF/AACN NCIN Scholarship Program, which assessed socioeconomic indicators including income, being a first-generation college student, financial aid report, highest level of education obtained, and race and gender. Students submitted resumes and an essay about why they were strong candidates for the program. Individuals who met the criteria (of an underrepresented population in nursing and demonstrating financial need) set by the RWJF/AACN NCIN Program were selected to be interviewed. After interviews were conducted and scored using multiple reviewers and a standardized process, final award recipients were determined. Although each scholar was awarded a partial scholarship, the students were assessed to ensure realistic and thoughtful plans were made regarding tuition and living expenses during the accelerated year. Determining whether the student was eligible for the amount of student loans or other financial aid needed to cover these expenses was important. The $10,000 provided by this scholarship covered the majority of the tuition for one semester. During the interview process, students were asked about their plans to cover the remaining tuition and living expenses for the remaining three semesters. Their ability to qualify for federal loans or private loans was considered during the final selection process. Students were encouraged not to work during the program and were assisted to develop a financial plan to address the remaining tuition. Awardees received financial aid counseling from the Financial Aid Officer to ensure all potential sources of funding had been explored and pursued. The project director and an instructional designer collaborated to develop and administer a 7- to 10-week online, preimmersion course. The course was run in a hybrid fashion blending synchronous and asynchronous methods. Content addressed areas that students traditionally identified as troublesome. The following topics were covered in the online preimmersion: self-introductions, stress and time management, learning styles, critical thinking, reading skills, study skills, writing skills, personal wellness, communication, and building career success. The course incorporated interactive videoconferencing via Blackboard Collaborate® to allow for optimal instruction. Blackboard Collaborate allowed all the participants and the program director to meet online in a virtual classroom at the same time weekly. The online preimmersion allowed mentors to reach out and prepare scholars who lived out of state before they relocated, as well as local scholars, without the need to travel to campus. An unforeseen benefit, the scholars began to form peer relationships with each other before stepping foot on campus. Mentors were chosen who were master's- or doctoral-prepared in nursing and of an underrepresented gender or racial/ethnic background in nursing or had extensive experience and training in diversity and/or leadership. Mentors chose to participate and were uncompensated, which demonstrated their personal commitment and service. Mentors were trained through formal sessions on how to formulate goals with the mentees, evaluate goal attainment, set boundaries, and determine the frequency of meetings. Meetings with mentees took place weekly with one face-to-face meeting per month for the first semester. The remaining meetings could take place over telephone, e-chat, or videoconferencing to increase convenience for the mentor and student. During the final two semesters of the program, monthly meetings were required with mentors and often occurred more frequently per the student's needs. In addition to faculty mentors, some scholars were connected with minority peer mentors who were alumni of the School. When the importance of frequent meetings with the students was realized, a decision was made to incorporate technology to enhance flexibility and accessibility. Instead of meeting face to face with a mentor for all meetings, scholars could choose to meet via telephone or Collaborate videoconferencing. This alternative was made available due to the high faculty mentor and accelerated student workloads. Monthly brown bag lunches were provided to scholars during their final two semesters with invited community leaders as guest speakers along with 1-hour leadership skills training facilitated by the program director. The RWJF/AACN NCIN leadership toolkit was used to guide leadership topics and activities (RWJF, 2016a). Leadership activities explored concepts identified in the leadership toolkit provided by the NCIN Program as key skills needed of leaders, such as knowing your leadership style, integrity, inspiring a shared vision, collaboration, communication, building trust, team building, and conflict resolution. Rather than provide a formal or didactic presentation, community leaders were asked to engage scholars in a discussion of topics relevant to their field of research or clinical practice area as it related to being a leader. Question-and-answer sessions were provided. The goal of the leadership series was to help scholars begin to think about concepts of professionalism and community leadership and envision themselves in these roles. After coordinating many well-respected speakers, the dean of the school decided to open the lunch-and-lead sessions to all students enrolled in the accelerated BSN program on a voluntary basis for those who wished to attend the sessions. However, these sessions were mandatory for all the recipients of the school's NCIN Scholarship Program. Review sessions were held by lead course faculty prior to examinations or other formal evaluations to ensure that scholars were up to date on the critical knowledge and skills needed to pass their examinations or evaluations. The faculty members who lead the review session were the lecturers for the courses. When needed, scholars were provided a tutor to allow them an opportunity to ask questions and to receive clarification or further instruction on topics they found to be challenging. Tutoring was mandatory for students who demonstrated unsatisfactory examination scores in their individual classes. The program evaluation was approved by the University of Miami Institutional Review Board. 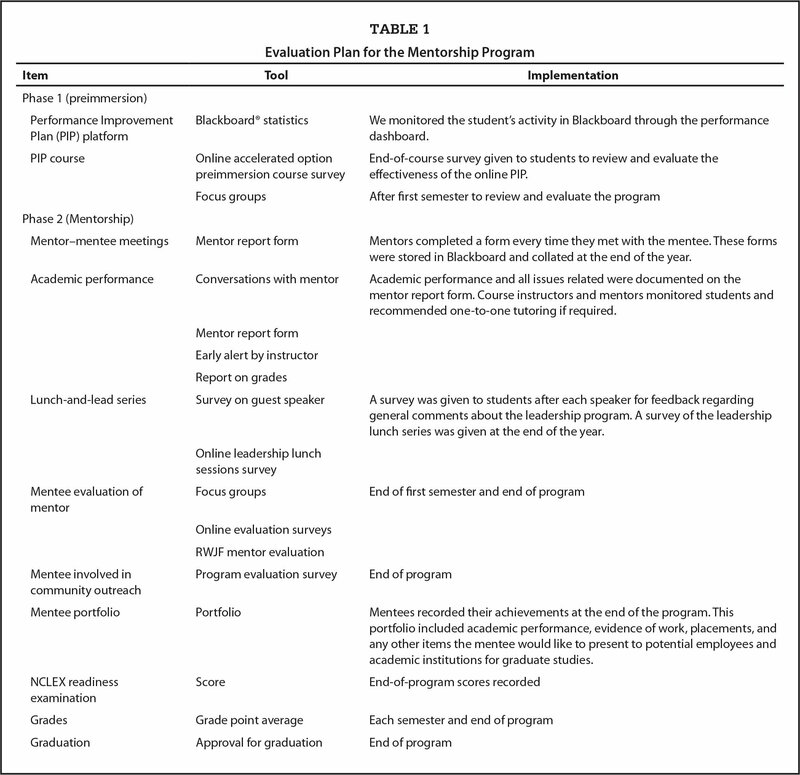 The program was evaluated in a formative and summative nature (Table 1). The program director met individually with each of the scholars at least once per semester. For those scholars who required additional support, the program director met more frequently. Through these meetings, the program director gained critical information about the needs of the scholars. Additionally, the program director met once per semester with each of the faculty members who taught the scholars during the given semester to obtain their input on the progress of each scholar. Mentors maintained standardized electronic logs recording the date, amount of time spent with the mentee, type of meeting, and whether any referrals were made. After program completion, scholars were e-mailed electronic surveys. Scholars were asked to respond to a faculty-developed, 33-item survey (Table 2) informed by the literature to ensure that input on various aspects of the program was obtained from every student. Face validity was determined by two faculty members with expertise working with minority nursing students. The electronic survey using Qualtrics™ included multiple choice, yes/no, and open-ended questions. A research assistant helped with data collection to assist with anonymity. Descriptive, quantitative data were tabulated by SPSS® software (version 24). Qualitative data were analyzed independently by two nurse researchers (K.S., C.F.) using Sandelowski's (2000) method of content analysis. Qualitative data were categorized with supportive quotes, and consensus was established on the emerged categories. Categories were supported with supportive quotations from the student participants. Due to the multiple components and evaluation points of this program involving multiple cohorts, only the key data were presented in this article. Forty-two participants were selected for the program (13 men, 29 women). Of these, 22 identified as Hispanic, nine were Black/African American, four were Asian, three were White, and four reported multiple ethnic backgrounds (Figure 1). Cohort 1 comprised five students. Cohort 2 had 10 students. Cohorts 3 and 4 had 15 students (divided into separate groups of eight and seven), and Cohort 5 had 12 participants. Two students withdrew from the program. Therefore, a total of 40 participants completed the program. Of the 40 participants, 100% passed the National Council Licensure Examination-Registered Nurse (NCLEX-RN) on the first attempt. 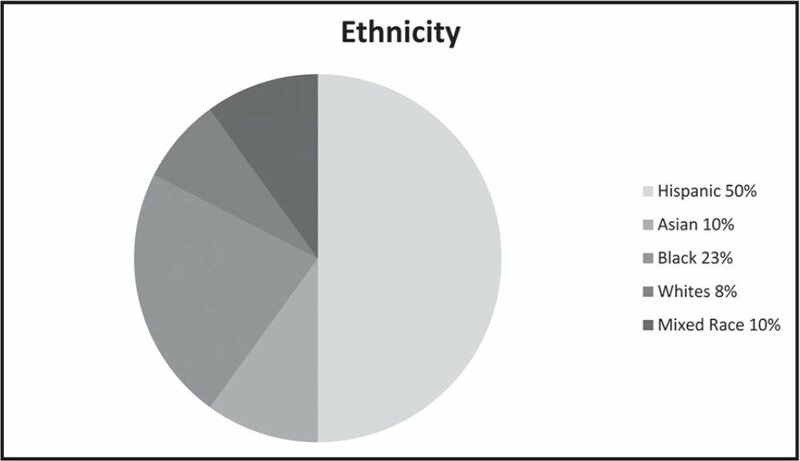 Participant demographics related to ethnicity. Twenty participants responded to the survey, for a response rate of 50%. Of these, 90% (n = 18) completed the accelerated BSN program in the 12 months as the program is designed, 5% (n = 1) completed in 13 to 18 months, and the remaining 5% (n = 1) completed the program in more than 24 months. All respondents (100%) indicated they were employed. They reported working in the following positions: 85% (n = 17) as RNs, 10% (n = 2) as research assistants, and 5% (n = 1) as advanced registered nurse practitioners. A quarter (25%, n = 5) of the respondents were in leadership positions within 1 year of working, and 45% (n = 9) of respondents indicated receiving workplace recognition meaning they had received an award. Of the respondents, 30% (n = 6) were currently enrolled in graduate school and 70% (n = 14) reported intent to attend graduate school. Eighty percent (n = 16) of respondents either agreed or strongly agreed that the leadership series prepared them to be future leaders, with the remaining 20% (n = 4) responding as neutral. An overwhelming majority, 95%, (n = 19) either agreed or strongly agreed that the RWJF/NCIN Scholarship Program was critical to the completion of their accelerated BSN program, with 5% (n = 1) disagreeing. Moreover, 90% (n = 18) of respondents either agreed or strongly agreed that the skills learned in the leadership series were useful in their roles as an RN or in their related field. Salary data and loan data are reported in Figure 2. 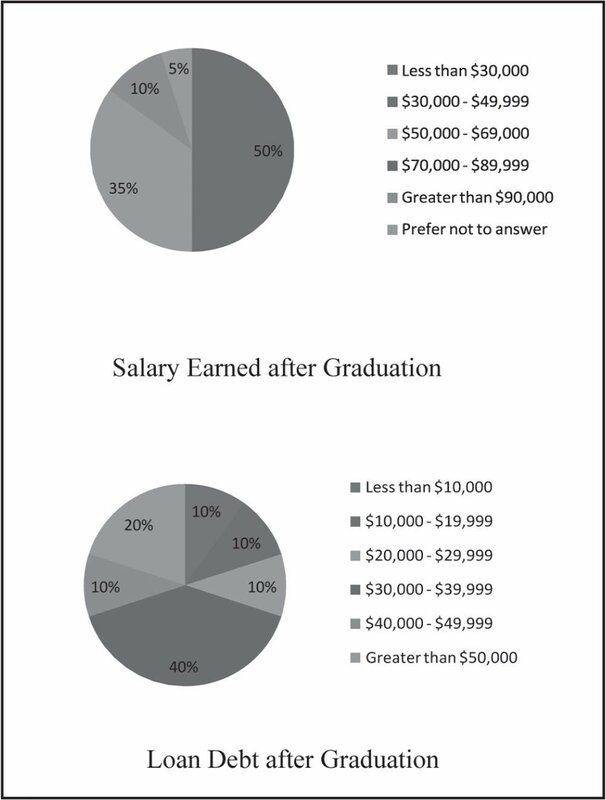 Participants' salary earned and loan debt after graduation. Mentors met with the students almost every 2 weeks throughout the accelerated program. The length of time for these meetings varied based on the student and his or her individualized needs. Most of the meetings were conducted face to face; however, in some instances, sessions were conducted via e-mail or telephone. Students who were challenged by the rigor of the program and were struggling academically sought psychosocial support more often from their mentor. The average length of time of student mentor meetings ranged from 30 minutes to 2 hours weekly. The average total amount of mentor–student time during the program was 276 hours. Mentors provided a variety of different support strategies and made different referrals based on the individual needs of the students (Table 3). From the qualitative data, the following five categories emerged: leadership, networking, mentorship, more time, and gratitude. Program evaluation data suggested this program was highly successful. All participants who responded passed their NCLEX-RN on the first attempt and all had obtained employment in their field. This is an optimal outcome for program graduates. Further, an impressive 25% of participants were already serving in a leadership capacity within 1 year of employment, with 70% planning to attend graduate school. The qualitative data supported the success, as students indicated learning leadership and networking skills. Participants indicated they wanted more time with their mentors, appreciated the mentorship, and expressed gratitude for the program. This program evaluation was conducted at a single site; thus, generalizability is limited. Only half of the participants responded to the survey; therefore, it is possible that those who had a poor experience may have chosen not to participate. We hypothesize that survey participation was lacking due to many students having moved or changed e-mail addresses; thus, the contact information for the survey used may not have been the most current. This is a common problem for educational institutions in terms of alumni follow up. Further, many of the quantitative and qualitative data were obtained by self-report. It is possible that social desirability influenced what participants decided to report. However, meaningful measures, such as the NCLEX-RN pass rate of all participants, were verified objectively. Through administering the program over 3 years, valuable lessons were learned. The videoconferencing and online delivery worked well for the preimmersion course; however, twoway videoconferencing was not well received for the student–mentor meetings. Face-to-face or telephone meetings with scholars facilitated a more genuine connection according to the faculty mentors. Additional lessons learned refer to working for an ideal match between mentor and mentee. On the basis of prior mentoring experiences, the program director learned to intentionally attempt to match personality styles and identify faculty mentors who would demonstrate the flexibility and time commitment deemed critical for program success. When a student–mentor relationship suffers problems early on, changing mentors is suggested. Finally, the faculty members who mentored donated significant amounts of time to the individual students. Although there was recognition of their contributions including a plaque, it is suggested that faculty mentors receive workload support when possible. In 2015, the RWJF/AACN NCIN Program awarded the final grants and closed the program. Unfortunately, the program was unable to be sustained without the funding. Based on our evaluation, the program appeared to be highly successful. We feel the combination of the financial support for students achieved through the scholarships and the mentoring they received were the most critical and assistive features of the program. Until improved proportions of minority leaders are demonstrated in health provider and academic roles, we urge continued support for similar initiatives from national agencies. This innovative mentorship program was designed to support accelerated BSN students who were underrepresented in nursing. With a highly structured mentorship framework in place, scholars and mentors knew their roles and expectations and scholars were linked with individuals who could advise and connect them to succeed. Frequent contact with scholars was critical to form a supportive relationship and allow for early intervention. Nurse educators and students may benefit from viewing this framework. To increase the diversity represented in future nurse leaders, continuing efforts to provide scholarships and mentoring for the underrepresented in nursing may help to someday reach parity across the profession promoting a nursing workforce that more accurately depicts our communities and populations served. Performance Improvement Plan (PIP) platform Blackboard® statistics We monitored the student's activity in Blackboard through the performance dashboard. PIP course Online accelerated option preimmersion course survey End-of-course survey given to students to review and evaluate the effectiveness of the online PIP. Mentor–mentee meetings Mentor report form Mentors completed a form every time they met with the mentee. These forms were stored in Blackboard and collated at the end of the year. Academic performance Conversations with mentor Academic performance and all issues related were documented on the mentor report form. Course instructors and mentors monitored students and recommended one-to-one tutoring if required. Lunch-and-lead series Survey on guest speaker A survey was given to students after each speaker for feedback regarding general comments about the leadership program. A survey of the leadership lunch series was given at the end of the year. Mentee portfolio Portfolio Mentees recorded their achievements at the end of the program. This portfolio included academic performance, evidence of work, placements, and any other items the mentee would like to present to potential employees and academic institutions for graduate studies. How long did they take to pass NCLEX? How many attempts to pass? Secure a job? Recorded during a follow up phone call. Students will also have the opportunity to update their information on the SONHS website via a link specifically for tracking RWJF graduates. How long to secure a job? Leadership position? Describe. Postprogram survey SONHS website link Recorded during a follow up survey. Students will also have the opportunity to update their information on the SONHS website via a link specifically for tracking RWJF graduates. Enrolled in graduate school? Postprogram survey SONHS website link Recorded during a follow up survey. Students will also have the opportunity to update their information on the SONHS website via a link specifically for tracking RWJF graduates. How long did it take you to complete your accelerated BSN program? If not, how many attempts did it take you to pass, and how long after graduation did you pass the NCLEX? What was your educational debt after graduation? In what state are you currently employed? Where are you currently working (institution/agency)? What are your current duties and responsibilities under that job title? Have you been in any leadership positions since you started working? If yes, what is your title? Have you received any workplace recognition since you started working? If yes, please briefly describe. What was your starting salary after graduation? Current salary? Are you currently enrolled in or completed graduate school? If yes, what is/was the degree pursued? If not enrolled in graduate school, do you plan to attend graduate school? If yes, what degree will you pursue? The leadership series prepared me for future leadership roles. The UMSONHS RWJF Scholars Program was critical to my completion of the accelerated BSN program. The UMSONHS RWJF mentorship program provided the right amount of support that I needed to get through the program. The skills I learned in the UMSONHS leadership series were useful in my role as an RN. What did you gain professionally and/or personally from your participation in the UMSONHS RWJF Scholars Program? What key aspects UMSONHS RWJF Scholars Program have been the most helpful in your career as an RN? 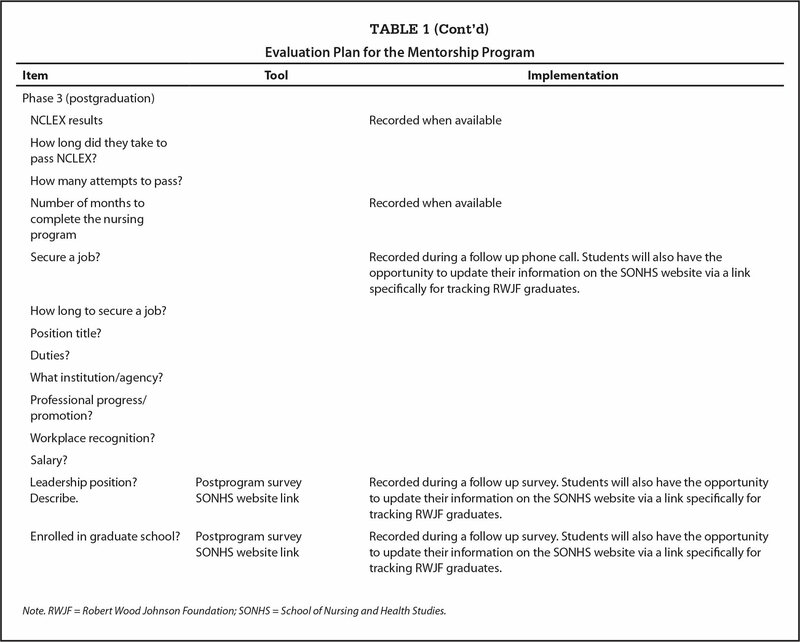 What areas of the UMSONHS RWJF Scholars Program could have been improved? Dr. Snowden is Assistant Professor of Clinical, Dr. Foronda is an Associate Professor of Clinical, Dr. Gonzalez is Assistant Professor of Clinical and Director of the Family Nurse Practitioner Program, Dr. Salani is Associate Professor of Clinical, Ms. de Tantillo is a doctoral candidate, Dr. Hooshmand is Assistant Professor of Clinical and Associate Dean of Doctor of Nursing Practice Program, Dr. Ortega is Associate Professor of Clinical and Associate Dean for Master's Programs and Global Initiatives, School of Nursing and Health Studies, University of Miami, Coral Gables, Florida; and Dr. Peragallo Montano is Dean and Professor, School of Nursing, University of North Carolina at Chapel Hill, Chapel Hill, North Carolina. Support for this program was provided by grant 68981 from the Robert Wood Johnson Foundation/American Association of Colleges of Nursing New Careers in Nursing Program. The authors thank Vernell P. DeWitty, PhD, RN, Director for Diversity and Inclusion American Association of Colleges of Nursing for her guidance, support, and oversight during the course of the New Careers in Nursing Program. Address correspondence to Kenya Snowden, DNP, APRN, FNP-C, Assistant Professor of Clinical, School of Nursing and Health Studies, University of Miami, 5030 Brunson Drive, Coral Gables, FL 33146; e-mail: ksnowden@miami.edu.